Watermans Urban Ambush Arts Summer School opened on July 29 and the first week got off to an amazing start. Over 100 gifted young people and their supporters gathered at Watermans on Friday last to watch the showcase of work created during the first week of Urban Ambush. The audience was treated to a performance of Aerial Acrobatics, a demonstration of documentary film making, the output from the Robots and Avatars digital media workshops and a 40 foot long mural in the Car Park created by the Graffiti Artists. A spokesman for Watermans said: "It is amazing how creative young people can be with the right direction and opportunity. In every case the young performers and creators were working in an art-form that was new to them. They started the week with a blank canvas and just a lot of hope and enthusiasm. Over the course of five days they were encouraged to let their imagination loose, to learn new skills and given the confidence and freedom to express themselves." Photographs cannot capture the creativity of the moving image or the digital exploits of the groups. 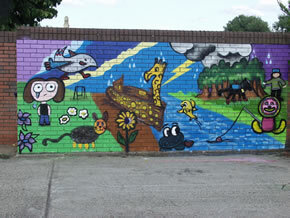 However the outputs of two of the workshops are shown in these images, Aerial Acrobatics and Graffiti Art. 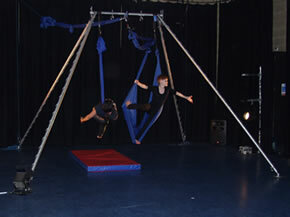 The Aerial Acrobats had to develop their mobility before they took to the air. The Graffiti Artists had to work at planning their end-result before they started painting. In every case the 'journey was as important as the destination' and everyone left, happier and more confident than when they arrived.